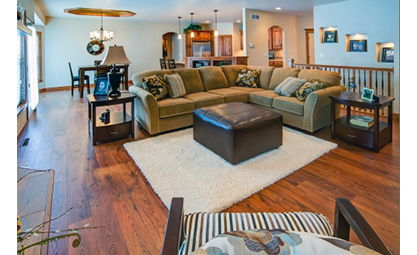 Home Builder in Green Bay WI | Thompson Homes, Inc. Welcome to Thompson Homes, Inc.! View Showcase Events Please check out our newest brochure! At Thompson Homes, Inc. we have been designing and building homes in Green Bay, WI and across Northeastern Wisconsin for the last 30 years. In 2005, Thompson Homes Inc. received the Governor's Award “Custom Builder of the Year” in Wisconsin, which recognizes our commitment to excellence. As a partner with Focus on Energy's New Homes Program, our finished homes promote energy efficiency, combustion safety, quality, and durability. Thompson Homes is also a fore runner in the design and build of universally accessible projects, which means we create homes that meet specific requirements for people with disabilities. Ultimately, our aim is to approach every new project the same way we would our own. Paige and Joe Van Elzen work together as a team to bring the vision of your home to life. Every home starts with a plan, or design. Paige Van Elzen brings with her over 30 years of design experience, as well as a bachelor's degree in interior and architectural design. With more than 20 years of construction experience, Joe Van Elzen sees that your design is brought to completion. His background as a plant and manufacturing engineer, attention to detail, ability to multitask, and competence in all areas of construction, make him perfect for the job. Of course, nothing could get done without the work of our highly talented and skilled craftspeople. Many of our workers have been a part of the company for more than 25 years, offering you quality, consistency and experience in all our projects. The Van Elzens are proud parents of three active children. Joe and Paige are both involved in their community and church. The Van Elzen's believe their Boss was once a Jewish carpenter. 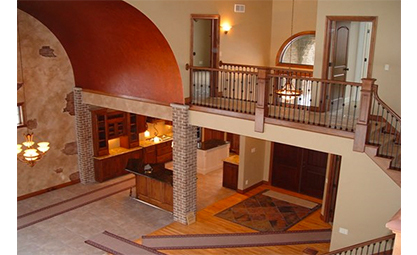 For excellence in home building and design, contact Thompson Homes today at (920) 592-1111.